There’s an old story about a woman who approached Pablo Picasso in a cafe and asked him to draw her something on a napkin. However, before he would give it to her he asked for an exorbitant sum of money because that tiny sketch represented the culmination of his life’s work up to that point. Not many of us ever actually cross paths with a great artist, let alone get up the gumption to ask him or her to create something just for us. Still fewer will have an artist create on his own something so very personalized that it could only ever be yours, and then hand it to you as a mere throwaway gesture. Jak Smyrl in a typically rendered self-portrait. I was fortunate enough to have that happen to me thanks to a gentleman named Jak Smyrl. 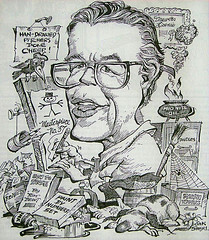 He was the first staff artist for The State newspaper, the major daily newspaper that covers Columbia, S.C., and the surrounding area. His satirical map of South Carolina (rife with intentional misspellings and regional in-jokes) was first published in the late 1960s and since then has become iconic. His style mimics that of many of the best Mad magazine artists with a flair that was straight-up Southern. 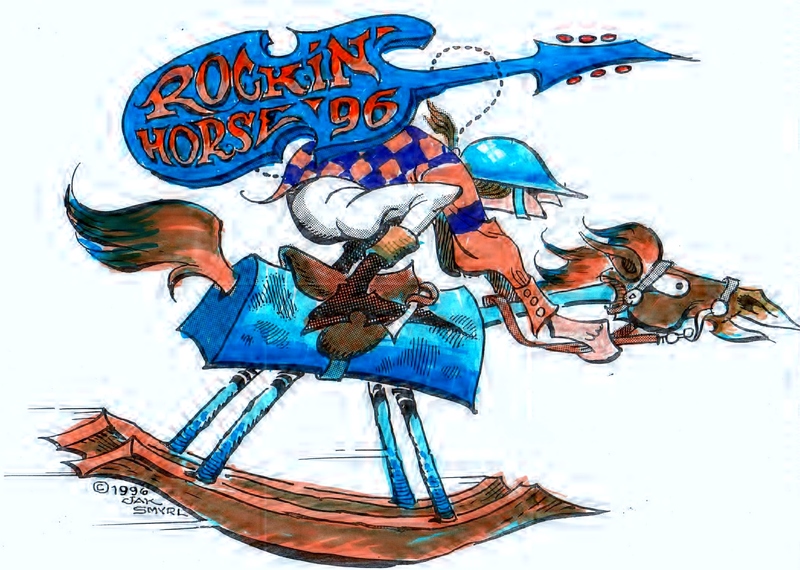 Back in 1995, when I was a young reporter and columnist at the Chronicle-Independent in Camden, S.C., Jak, who had retired to Camden, was suggested to me as someone who could create a logo for Rockin’ Horse ’96 (top). Rockin’ Horse was a concert that grew out of a newspaper column I wrote calling for more entertainment surrounding the Carolina Cup steeplechase event, which annually brings in more than 60,000 visitors and millions of dollars to the town of about 8,000 or 9,000 people. The concert was held on the grounds of Historic Camden as a benefit for the Revolutionary War historic site. 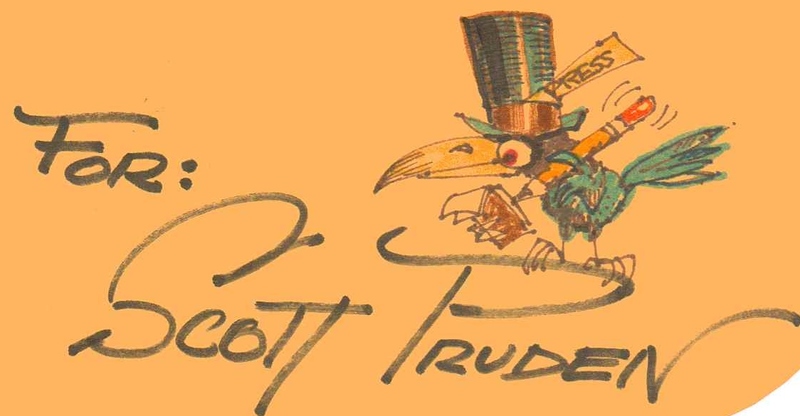 In the absence of our own newspaper staff artist I could hire to do the logo on the side (we got all our editorial cartoons from syndicates), one of the ladies in the layout department suggested I get in touch with Mr. Smyrl. She described him in loose terms as a former artist for The State, a description that really only scratched the surface. We met at his home studio and I did a rough sketch of what I was looking for. He gave me an anticipated date of delivery for the final image and we worked out terms that were entirely too reasonable for someone of his stature (I seem to recall he asked about $100 for the image). When I went to pick up the sketch, he was out of the house, but he had left it for me in a manilla envelope adorned with the personalized image you see to the right. As a result, an item that would otherwise have been recycled or tossed in the trash became, for me, a valuable work of art. Jak, who died in 2007, is the subject of a new exhibit that was recently dedicated at the University of South Carolina. That means a significant number of people who actually know what they’re talking about considered his work a valid subject for study and appreciation. I’m not sure where the rocking horse-and-jockey drawing I commissioned for the concert stands in that body of work, but I do know it adorned t-shirts, tickets and banners associated with the event. If you lived in or visited Camden in the spring of 1996, chances are you or someone you know could still find a Rockin’ Horse ’96 tee stuffed in the back of a drawer somewhere. Maybe if I contacted the University of South Carolina they’d ask to include it. If so, I’d happily donate it to the collection. However, as for that small bit of an ordinary manilla envelope that in a few pen strokes became something only for me, that I’ll treasure as my own little napkin from Picasso.